Our premium mosquito shelter for the lightweight camper. The 300 hole/square inch polyester mesh provides extra protection from biting insects, without stopping cool breezes. A small fiberglass pole provides extra headroom with a single attachment point. Compact and light for easy packing, the Hiker's Shelter is ideal for fast trips where space is at a premium. Our premium mosquito shelter for the lightweight camper. The 300 hole/square inch polyester mesh provides extra protection from biting insects, without stopping cool breezes. A small fiberglass pole provides extra headroom with a single attachment point. Compact and light for easy packing, the Hiker&apos;s Shelter is ideal for fast trips where space is at a premium. 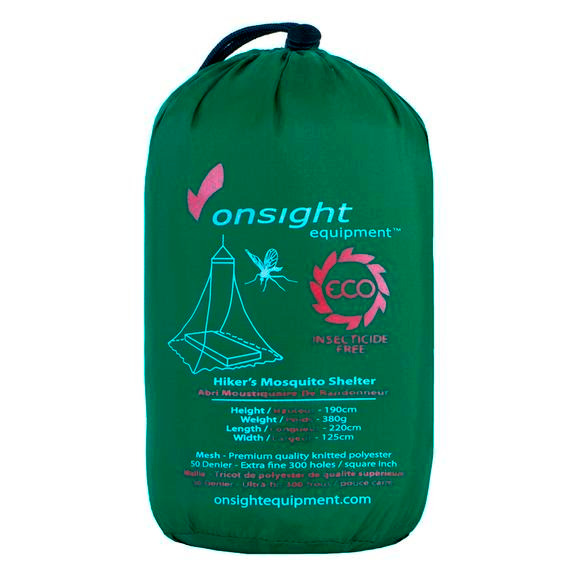 This product provides quick and effective protection from Malaria, West Nile Virus, and other mosquito borne diseases. Stuffed Size 7.9" x 4.3"